Back in January, I shared a review of the Oxford Street exclusive, Lush Prince of Darkness Fresh Face Mask. I think over the years I have tried every single fresh mask on offer from Lush and Prince of Darkness was the first one which didn't live up to my expectations. Nevertheless, it wasn't enough to put me off of the range and I still recommend the fresh face mask range to friends and family who are looking for a more affordable option when it comes to skincare. I love the range so much, that I've added another to my tried and tested list, this time opting for Lush Rosy Cheeks Fresh Face Mask. In benefits for the skin, it works very differently to Prince of Darkness, in fact, it's one of the nicest masks I've tried from the range in my time as a self-confessed Lush obsessive. It uses an incredibly and gentle formula with ingredients such as Kaolin, Calamine and Turkish Rose Oil, which by the way, gives this mask the most beautiful and relaxing scent of fresh roses. The Kaolin helps to remove dirt and impurities, whilst Calamine cleanses and the Rose Oil helps to nourish, soothe and tone. It is an incredibly lovely mask to use and using straight from the fridge, as all Lush Fresh Face Masks must be stored in the fridge due to their fresh ingredients and short expiration dates, is super soothing as soon as you start applying. As with any face mask, I use an old foundation brush and apply quite a decent amount, using all over rather than spot-using in certain areas. I find overall it benefits my skin in all areas of my face whether that be my dehydrated forehead or my blemish prone chin and nose. Once applied I leave on for the recommended 10-15 minutes before removing with a warm muslin cloth and following up with my usual skincare. 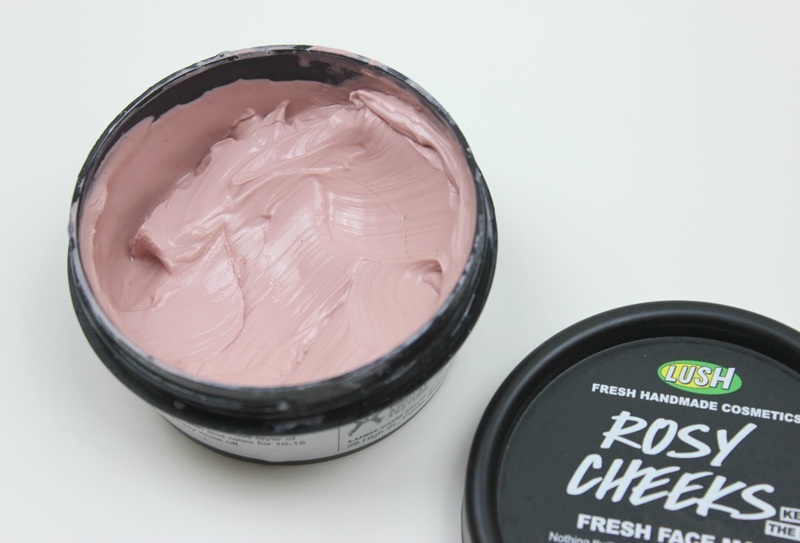 Rosy Cheeks is one of the best Fresh Face Masks I have tried from Lush in years and it certainly takes top spot as my favourite from the newer additions which have been added over the last year or two. Would I repurchase? Definitely! I think this may a permanent addition in my future Lush orders, that's how much I love it. You can pick a 75g tub, which usually lasts me around 6 to 8 uses, for £7.25, both in-store and online at www.lush.co.uk. This sounds lovely. My skin has become more sensitive lately. I really like the chocolate cupcake mask they do. I have always fancied trying this one but every time I go into my local Lush they say they don't recommend it for my skin type. At the moment I have their BB Seaweed fresh face mask in the fridge which is super refreshing and leaves my skin feeling great but it's SO messy! I need to try this one it sounds really good i love the lush masks they last so long!